A boy makes friends with an innocent alien giant robot that a paranoid government agent wants to destroy. BEFORE: Brad Bird is the director of both The Incredibles, which is one of my favorite animated films, and Mission: Impossible — Ghost Protocol, my favorite of all the Mission: Impossible films. I have high expectations for Bird’s directorial debut, The Iron Giant, but I’m confident he will deliver. AFTER: The film lived up to my high expectations. It was a fun story with believable characters. Hogarth Hughes (Eli Marienthal) and his mother Annie (Jennifer Aniston) display a realistic mother/son relationship. 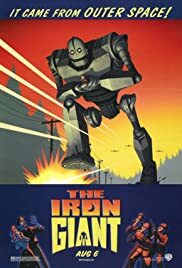 And then, of course, there’s The Iron Giant (Vin Diesel), who Bird transformed from a giant, metal robot into a human-like character with feelings and emotions. My only, minor, criticism of the film would be how coincidental things seemed to occurred. For example, the scenes when Hogarth goes looking for the giant after their first encounter or the giant’s reaction when he and Hogarth are playing in the junkyard seemed to force the plot along rather than naturally progress the story. Overall though, The Iron Giant is a great start to a wonderful career by Brad Bird.